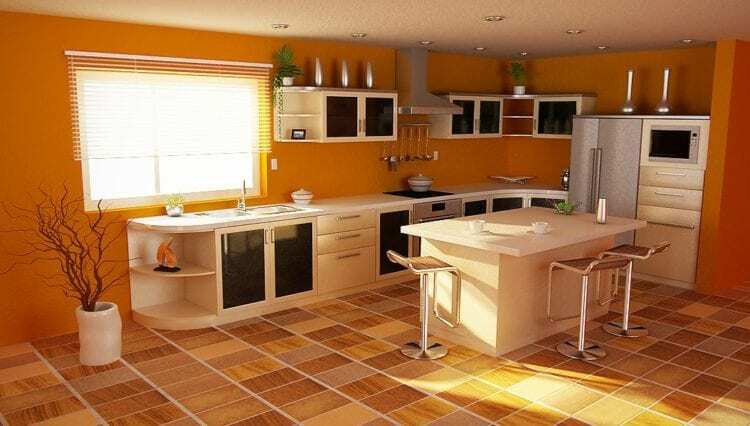 FeastHome – Orange color kitchens is one recommended color for your kitchen. Why? This kind of color is warm, cheerful, and welcoming. It will bring happiness and liveliness into your busy kitchen. In using this color, you have to keep in mind to keep it away from being too much. It’s obvious that an orange color would be great as an accent. 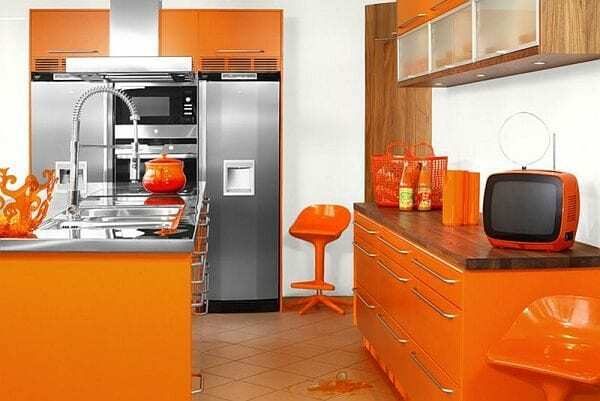 However, it’s not wrong having orange as the main color of a room, including a kitchen. 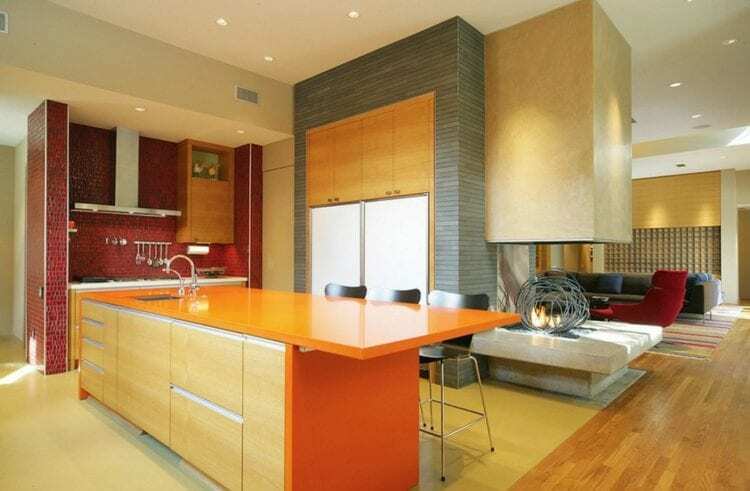 You can have a large orange cabinet, orange kitchen island or just orange flowers as a centerpiece of the countertop. 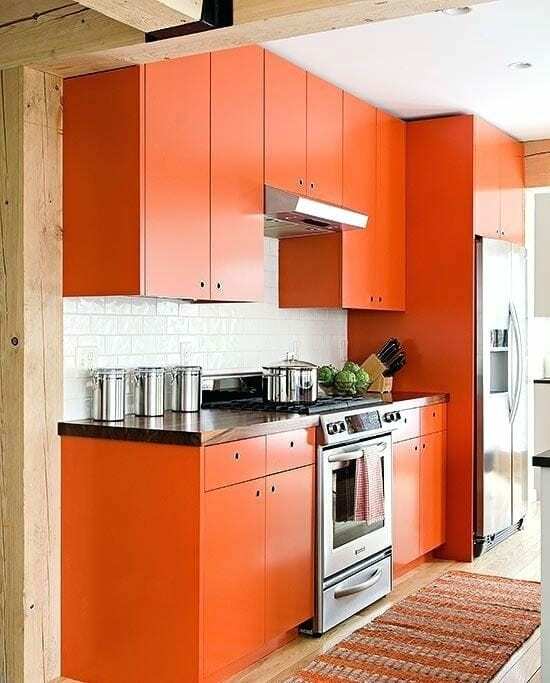 Here are 17 kitchen ideas that use the colors orange as the main color scheme. The color of orange is quite close to a retro style. This style is a perfect element to spice up your kitchen. 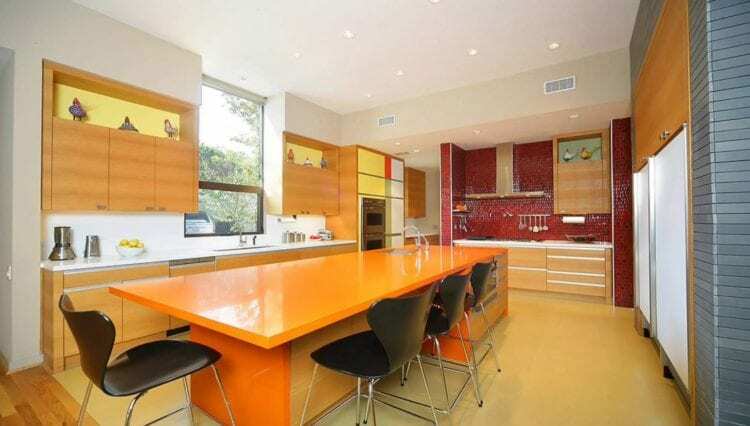 As you can see, the cookware, dishwasher, and refrigerator are colored orange. 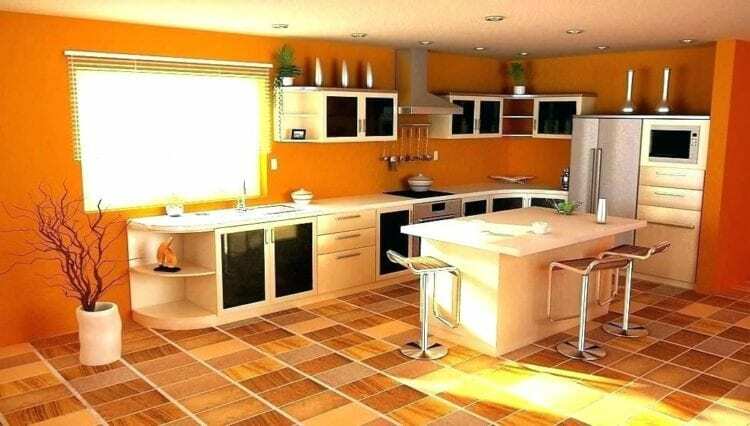 The white cabinet is very supportive with orange which is balanced with the flooring feature. The natural brown color blends well with the orange color. The level of orange in this kitchen is very high. There’s an orange color everywhere you go in this room, from those cabinet drawers too small elements like that old-fashioned TV and other accessories. The addition of such retro accessories really strengthens the nostalgic feeling that this kitchen design intended to bring out. This hue looks really fresh. When you have it in your kitchen, you can feel the energy every morning. It may increase the mood to start your day while you’re enjoying your breakfast. Choosing such color to be applied in your kitchen is an easy and inexpensive way to update your kitchen. You can start now. A kitchen island is automatically described as the focal point of the house. It’s like the heart of the kitchen. Most of the activity in the kitchen is placed on the island. So, it’s important to consider this element as the essential one in the kitchen. 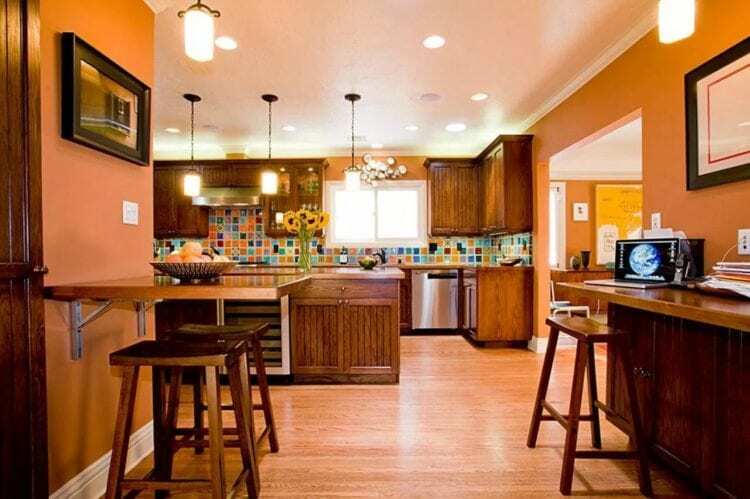 Orange color would easily make your island to be the center of attention. Because it’s the boldest and most interesting hue you can have in your kitchen. The size of this kitchen table is pretty large because it’s merged of table and kitchen island. It’s dominated by the color of orange attached with light wood element. The natural light wood color seems to be the one that matches really well with colors orange. As you can see, the entire cabinets use light grainy wood material. The soft yellow on the flooring is there to make a perfect base besides the white ceiling. Bright shades are an important element for small rooms. 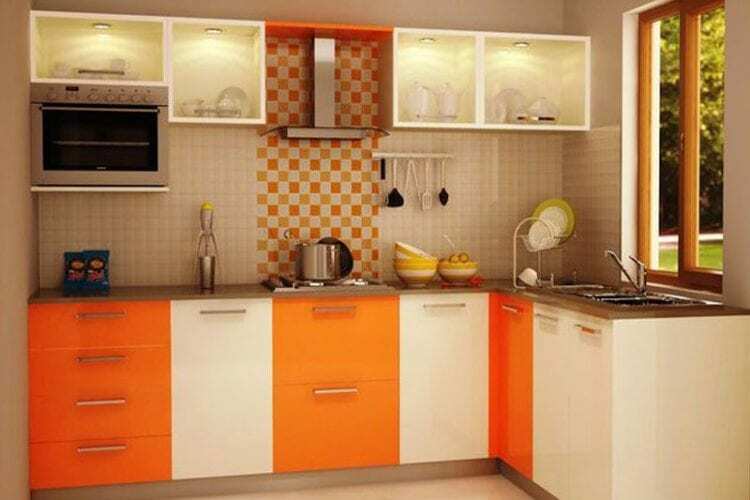 Combining orange with bright white is a good idea for a small kitchen. As you see in the photo, both colors are harmoniously contrasting the atmosphere. It’s a simple idea to apply in order to make the kitchen of your house more energetic and full of emotion. The color of orange in this kitchen is used as the base. It’s painted all over the wall in the kitchen. The designer uses a softer color to let the lightings illuminate the color. The orange shades of this kitchen are already warm but a lot of lightings and dark wood accent made it even warmer than ever. This must be one of the most comfortable kitchens you can have inside your house. Speaking of modernity, this kitchen has everything to offer from the main element to accessories. As you can see, that orange cabinet on the background paired with black backsplash which offers a chance for orange color to be more powerful. The backsplash also matches the color of the flooring. This open kitchen has a unique way to separate each room. To separate with the living room the flooring is leveled up. 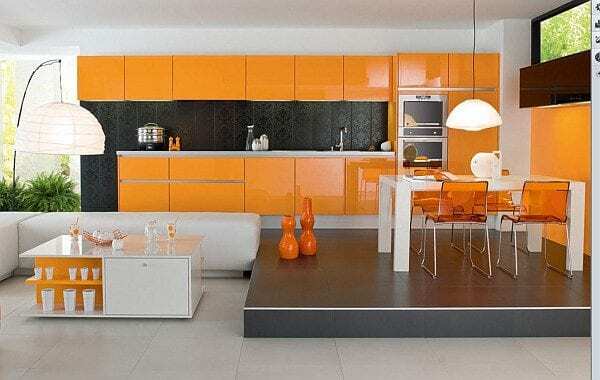 Orange is a kind of color that won’t be the first one that comes to your mind in designing a kitchen. But, it’s definitely not the last choice for its interior. This color has a strong shade which is supportive of people’s appetite. 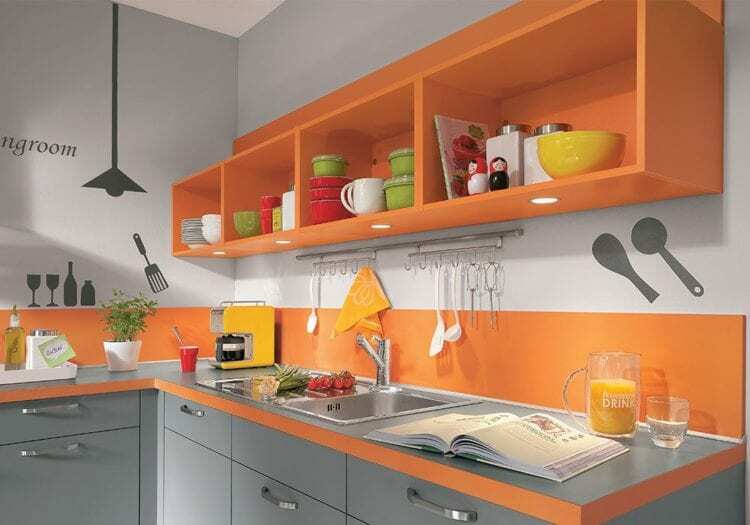 A cheerful and soothing color like orange would definitely be a great option for the kitchen to make it more alive. This orange hue appeared like it is burning or the color of fire. It’s even better with the sunlight from the outside through the windows. You can set the mood of this orange kitchen with lighting during the night to keep the fiery feeling. Combining bright grey hue with a dark color is quite ideal. For many times, a lot of designers have successfully blend orange with dark colors like brown or black. So, grey won’t be a problem. This orange color is quite light. It’s close to the color of yellow. If you plan to have an orange kitchen but you don’t want it to be so strong. This colors kitchen is something your kitchen should try on. The flooring pattern seems to be giving a lot of support to the kitchen. 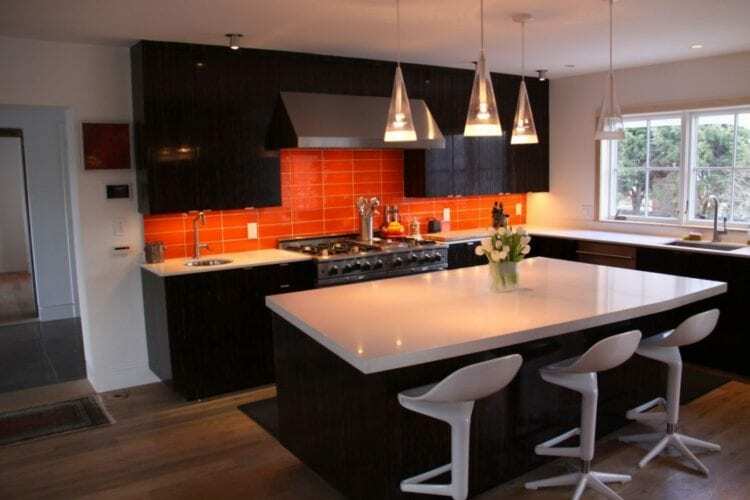 Adding an orange color in the middle of the black and white kitchen is something you might not think of. In order to pursue the warm sense for the kitchen, the orange color is installed only on the backsplash and it’s lighted. 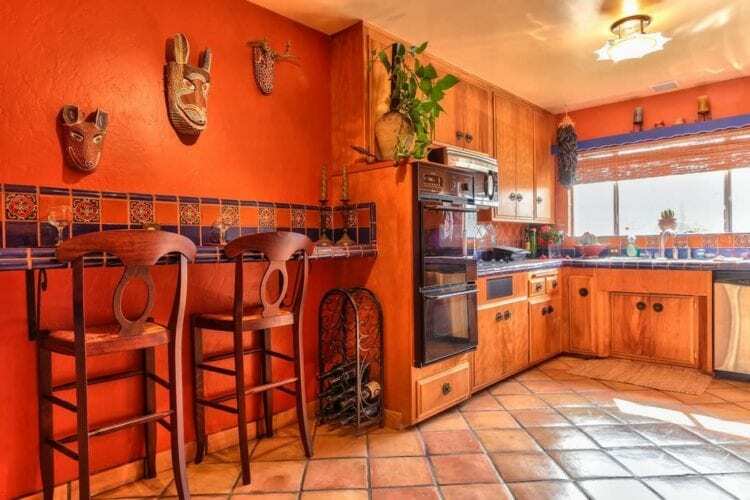 The Mexican tile in this kitchen inspired the whole thing in this room. The ethnic elements of this kitchen bring joy to everyone. It’s something useful to put some little fun to your kitchen design scheme. As you can see, this kitchen is packed with stickers that make it more interesting besides that orange. The orange background wall is actually the only one appeared to be the center of attention in this kitchen. Pairing orange with the black-white environment is surely the right thing to do. 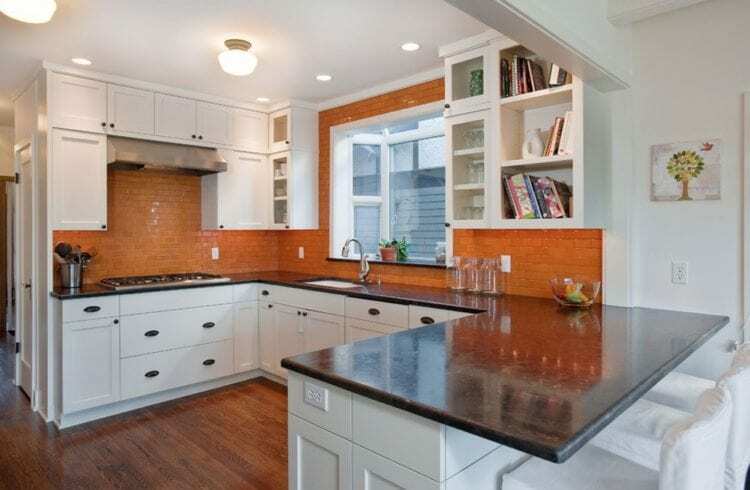 The orange backsplash tile is making a good statement between that white cabinet set. 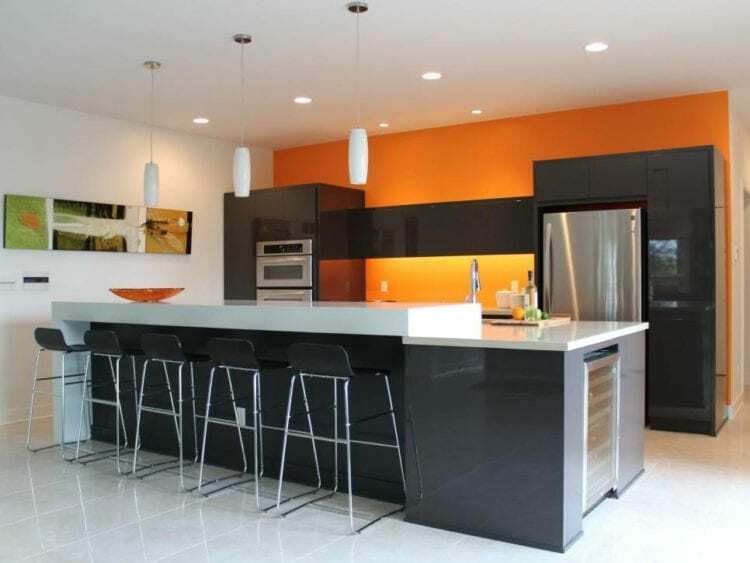 The cabinet is packed with black kitchen countertop which managed to befriend the orange hue. 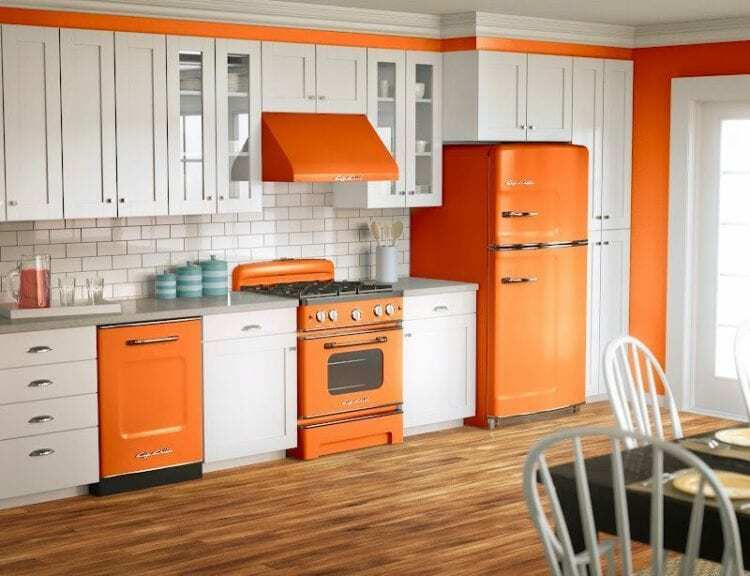 Apparently, the orange color is such a great thing to have in your kitchen even though it’s not the first thing that people have in their mind.